This is your real first taste to Kiteboarding! Once you demonstrate proficient Kite Skills to your coach with the downwind body drag and upwind body drag, its now the exiting time to introduce the board. Its a lot of information to take in and execute as you progress so be conscious of these 4 key stages during your first attempts and you’ll be ripping in no time! Relax. Getting the board on your feet can be a little awkward. Especially if you have long legs! Insure your foot straps are fairly loose so you can slide your feet in nice and easily. You just want enough hold so you can control the board for the first few attempts of riding. Its only natural for you to now tense up, pull on the bar, not pay attention to the kite and focus on getting the board on. Your number one priority is your kite control. The kite must be directly at 12 o’clock above your head! If not you will start to spin in the water or awkwardly twist as you try to get your feet in the straps. Look at your hands, relax your forearms, ease your core. Focus on your kite control, sit back and slowly work on getting your feet in the straps while your board is at 90 degrees to the wind window. Once your settled in the straps with your kite at 12 you can start to think about your figure of 8 movement. Similar to your downwind body drag but more directed to your desired direction of travel. Choose which way you want to go and work from 12 o’clock. You can start to increase your turning input (through the bar by pulling) harder and faster which will generate more power. This is when you build up your muscle memory and also test how much power you need to generate given the conditions. For example: If your riding a 7m kite in 25+ knots, work slowly from 12’ to 2o’clock and see how much power that gives you. Remember, too much and you will super-man in classic fashion. Not enough and you will tea-bag your bum out of the water and move a short amount. Its all about balance here. As a new Kiteboarder you don’t have the muscle memory to decide how much input to put into your figure of 8 so build up slowly and understand your kite movements. You’ll learn to adjust accordingly to your gear and the wind conditions. 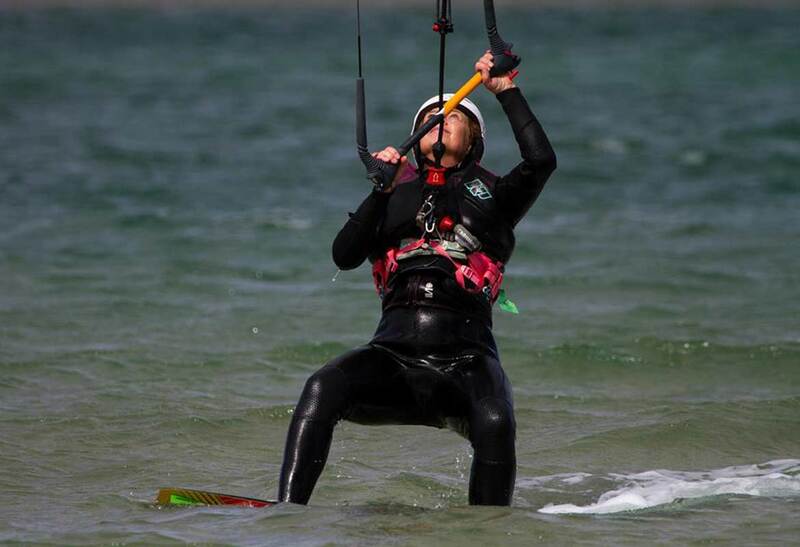 Once you feel more confident with your Kite control and gauging how much power you need to generate, try to roll your knees and hips on top of the board to stand up. Remember, hips up, shoulders back. Your not taking a number #2 now are you? Lets perfect that perfect stance now. Keep your shoulders behind your feet to insure maximum power control. If your shoulders roll past your feet, you may be guaranteed a salt water face plant. Be prepared for more power if it comes through with your kite dives. Once you feel like you are in motion straighten your front leg and apply about 60% of your body weight onto your back foot. This will get you moving in a cross-wind direction and start to initiate “edging” of the board to power yourself “upwind”. Imagine your body as a 7 shape, this is a great, efficient stance! Now, we all have our favourite side. More so for you already boarders from the wake boarding or snowboarding world. We are about to break that habit. Its all about equal muscle memory building from now on. You’ve just learnt to control the kite now you are going to learn to ride both sides, equally. You may struggle on your weak side but I can assure you, do the work now and you’ll be double the Kiteboarder in a few months then you would be being bias to one sided practise. You wouldn’t learn to not reverse your car now would you? Now that would be awkward.